"Pride And Prejudice Book Summary-The Perfect Romance Novel!" 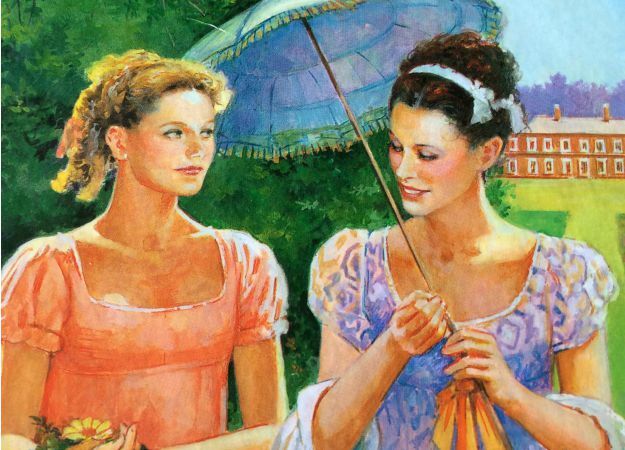 This Pride and Prejudice book summary illustrates all the valuable lessons learned by the Bennet sisters. Pride and Prejudice is a story about five sisters and the love affairs of three of them. The author, Jane Austen, does a perfect job of setting up her characters, making the reader feel like they can actually crack into the characters' minds and think the way they think and feel the way they feel. Jane Austen also does a great job in showing the reader that people are not always the way they appear when you first meet them. Jane Bennet is the oldest of all the Bennet sisters and is very sweet- natured. Whenever she is told that there is a fault in a person she feels sincerely bad and tries to polish them up and make them seem good. Jane is the sweetheart of Mr. Bingley. When Bingley leaves town, Jane is vexed and goes to London hoping to see Mr. Bingley. She does not see him and she returns home. Jane ends up marrying the man she loves and digging Lydia, who ends as the wife of an indebted man, out of all their debts. Elizabeth Bennet is much the opposite of her older sister. Fiery and decided, Elizabeth is ready to make anyone take the blame. She greatly looks up to Jane, but finds it very hard to find all the troubles in her life a coincidence. She looks upon Mr. Darcy, Bingly's friend as a proud man who she could never even imagine liking. She finds many faults in him and thinks that he is rude as well as proud. When Mr. Wickham tells her crazy tales of how Mr. Darcy “mistreated” him, Elizabeth decides that no matter what happens, she will never like Mr. Darcy. Later when Mr. Darcy proposes to her, she not only turns him down but also tells him the reasons for her refusal. Not long after, her eyes are opened to Darcy’s reasoning behind his mask of indifference. Mary is the third Bennet sister. She is the lover of books, knowledge, and accomplishment. She is forever correcting the rest of the family for their behavior. This really bugs Elizabeth who enjoys being loose with her manners at home and not always being corrected. Mary is very prim and seems to live a boring life as she never goes to the parties and almost never laughs once in the entire book. She never marries. Catherine Bennet is the fourth of the five Bennet girls. Her nickname is Kitty. She is uncontrolled and follows the example of her younger sister, Lydia. Flirty and unrestrained, Kitty finds a favorite in many men in Hertfordshire, especially among the officers! After Lydia’s marriage, Kitty is more controlled by her father and actually turns out as a very lovely woman. Kitty follows the example of Mary and remains single. She visits Jane and Elizabeth more than Lydia and learns to follow their examples. Lydia is the youngest and most untamed of the Bennet girls. As a young girl of sixteen, she flirts and talks boldly, much to the embarrassment of her sisters. She elopes with Mr. Wickham and distresses her whole family. When she returns as a married woman, she acts like eloping was the best thing she ever did in her entire life. She also takes pride in her husband, who is very embarrassed for what he did. She neither learns from her wrong or regrets it. She remains wild and flirty throughout the rest of the book. Pride and Prejudice is the novel best known for its romance. It has become the favorite of many young women. All may find themselves in one of the characters as there is quite a variety. Thank you so much for taking the time to read my Pride and Prejudice book summary! I enjoyed watching how Jane Austen forms the climax of the story and makes a very happy resolution. I thought that the ending was sweet how it tells how everyone ends their love affair and lived, so as to speak, “happily ever after”. I also liked how it followed the thoughts of just one character VS many characters. I hope you all enjoy reading this story as much as I did.